Before robots get to do the fun stuff, they’re going to be tasked with all of the things humans don’t want to do. It’s a driving tenet of automation — developing robotics and AI designed to replace dull, dirty and dangerous tasks. It’s no surprise, then, that warehouses and fulfillment centers have been major drivers in the field. Earlier this week, we reported that Amazon would be acquiring Canvas, adding another piece to its portfolio, adding to the 100,000 or so robotics it currently deploys across 25 or so fulfillment centers. Even Boston Dynamics has been getting into the game, acquiring a vision system in order to outfit its Handle robot for the warehouse life. Like so much of the robotics world, Pittsburgh is a key player in the world of automation. IAM Robotics is one of the more compelling local entrants in the space. We paid the company a visit on a recent trip to town. Located in a small office outside of the city, the startup offers a unique take on the increasingly important pick and place robotics, combining a robotic arm with a mobile system. The startup has mostly operated quietly, in spite of a $20 million venture round led by KCK late last year. After a quick demo in the office, it’s easier to see how early investors have found promise in the company. Still, the demo marks a pretty stark contrast from the Bossa Nova warehouse where we spent the previous day. There are a couple of small rows of groceries in a corner of the office space, a few feet away from where the rest of IAM’s staff is at work. 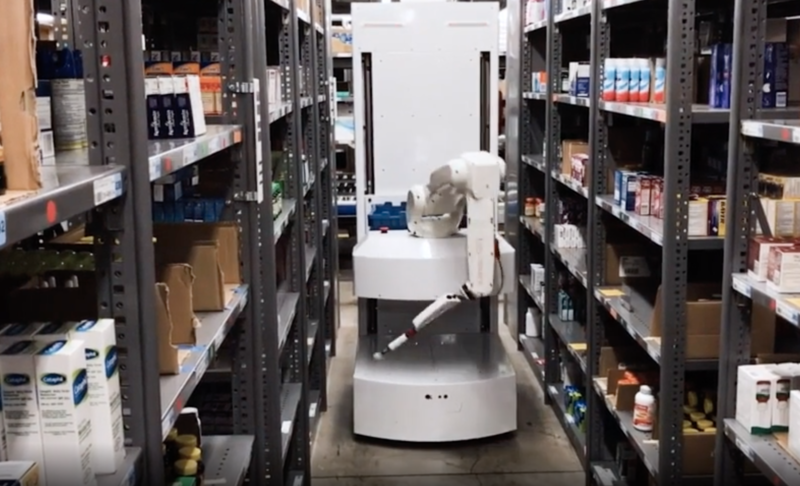 A pair of the company’s Swift robots go to work, traveling up and down the small, makeshift aisle. When the robot locates the desired product on a shelf, a long, multi-segmented arm drops down, positioning itself in front of a box. The suction cup tip attaches to the product, then the arm swivels back around to release it into a bin.